Upon introducing an assortment of possible storytelling avenues with “The Magician’s Apprentice” (the return of Davros and Missy, The Doctor’s confession dial and impending death, The Doctor’s role in Davros’ formation), showrunner Steven Moffat employs the season premiere’s second portion, “The Witch’s Familiar,” as a kind of story filter. He pushes some elements of the story to the side (the confession dial, which I can see playing out as a more season-long question), places less emphasis on others (The Doctor’s interaction with the young Davros) and, perhaps most importantly, highlights the areas that carry the most dramatic potency. In regards to the latter, the episode excels as a structured two-hander between The Doctor and Davros. Like Russell T. Davies before him, Moffat recognizes the value that an actor like Julian Bleach brings to the role of Davros. Despite being covered under layers of make-up, the actor is able to communicate not only great menace, but an intense sense of humanity as well. Indeed this episode’s most electric, dramatically rich moments come to the forefront when Peter Capaldi’s Doctor and Bleach’s Davros are simply stuck in a room talking to one another. That’s the beauty of Doctor Who and sci-fi in general—oftentimes, it’s the intimate, human moments that carry the most power in a world filled with shape-shifting time travelers, murderous robots and all-purpose screwdrivers. Despondent in the wake of Clara’s apparent extermination in the previous episode, The Doctor engages in a dialogue with Davros (the Dalek creator even procures for him “the only other chair” in all of Skaro). It’s here that Davros alerts him to a crucial bit of intel. By merely pulling his life-support tube, The Doctor would not only end Davros but also wipe out all the remaining Daleks who are connected to him. This notion of having genocide within grasp and deciding whether or not you can play God, relates back to the Genesis of the Daleks clip from last week’s episode in which Tom Baker’s Doctor mulled over whether or not he had the right to end an entire species, regardless of their heinous acts. Proving he has not changed several regenerations later, The Doctor refuses. Instead, he continues the two’s conversation, eventually revealing that Gallifrey still exists, hidden away in some pocket dimension where neither of them can get at it. To The Doctor’s great surprise and confusion, Davros congratulates his enemy on the restoration of his planet. Taking a page straight out of Return of the Jedi, an emotional Davros says he wishes to look upon his companion one final time with his “own eyes.” In a completely unprecedented moment, Davros shuts down his Dalek-like stalk and opens his blackened lids. Combined with last week’s flashback, it’s an effective means of confirming that, yes, Davros once did resemble a humanoid being. Now more vulnerable-looking than ever, Davros asks if he was right in trying to preserve his creations for all these hundreds of years. “Am I a good man?” he asks, positing the same question that The Doctor himself struggled with all through last season. Missy subsequently hatches a plan to re-infiltrate the city via the underground “sewer” tunnels. Because Daleks don’t’ actually go to the bathroom, these tunnels are not so much sewers as graves, containing generations of aged Daleks that have rotted into a black sludge. Daleks being Daleks, however, these are still as hateful as ever. Thus, when Missy summons a Dalek to their location and pokes holes in its armor, the old Daleks quickly leech into the younger model’s shell and exterminate him. Now left with an empty Dalek shell, Missy orders Clara to hop in so that the two can enter the city under the guise of a prisoner-captor relationship. In what’s sure to be one of the more controversial episodes for those keeping up with the admittedly jumbled and confounding Dalek history, Clara soon learns that the Dalek armor works to corrupt certain words and emotions. Upon trying to speak her own name, the armor merely spits out “I am a Dalek!” and phrases like “I love you” and “you are different from me” are translated to “Exterminate!” This means that the Dalek’s weaponry is fueled by intense emotions. It’s a heck of a development for Moffat to introduce into Dalek lore 50 years into their existence, but it’s one I’m perfectly willing to get behind, even if it might end up being forgotten or erased by subsequent installments. As Missy and Clara make their way through the city, The Doctor and Davros continue their Kumbaya moment. In an attempt to give Davros a final look at the sunset (he’s now too weak to fully open his eyes), The Doctor injects a bit of Time Lord regeneration energy into the life support system. It’s here that Davros unveils his true colors—he has Sarff (in snake form) latch on to The Doctor and trap him in the machine, thus draining more and more of his energy. Soon, not only has Davros’ health been restored, but the abundance of regeneration energy provides power to the rest of the Dalek army. Just when it looks as though we’re about to witness a new breed of Dalek/Time Lord hybrids, however, Missy breaks into Davros’ chamber and frees The Doctor. It’s here that our hero also reveals his hand. He knew what Davros’ scheme was and willingly went along with it. As a result of embedding his creations with regeneration energy, Davros inadvertently awoke the Dalek-filled sewers. If the Daleks hate anything more than Time Lords, it’s change. Needless to say, this new development does not sit well with them, and they begin attacking the new Daleks and causing the city to collapse in on itself. The Doctor and Missy take off, once again leaving Davros to fend for himself. From a logical standpoint, the immediate question is how The Doctor could have planned for Missy to save him, given that he thought both she and Clara were dead? Was his initial hope that Davros would stop the process before draining all his regeneration energy so as to better gloat at him? It’s one of those questions that one doesn’t think about in the moment, but reflects on during subsequent viewings. From a more character-based standpoint, the other major question revolves around how much of the two’s previous interaction we’re meant to take to heart. If we accept that our villain was feigning an emotional connection and our hero was allowing him to believe he’s succeeded at his deception, then does that take any meaning out of the moments of bonding that preceded this? Perhaps. In a larger sense, however, it does help fuel a theme. Throughout the whole episode, Davros attempts to make The Doctor realize that his compassion is a weakness that will result in devastation. Instead, by going along with Davros’ plan, The Doctor uses his compassion as a tangible weapon. By giving his enemy exactly what he wanted, he exposes the inherent flaw in Davros’ own hate-filled, compassionless creations. 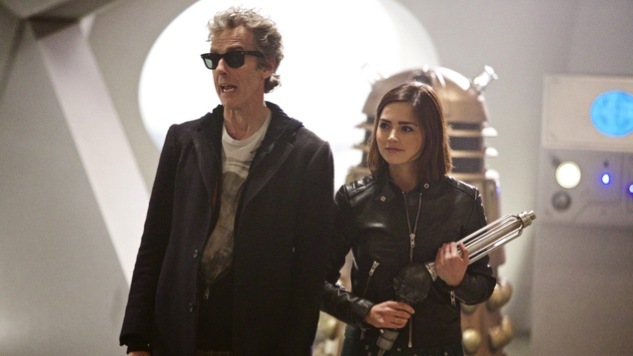 As The Doctor and Missy make their way out of the crumbling city, they run into Clara-in-Dalek-guise. Showing once again that she’s never capable of being a good guy for too long, Missy tells The Doctor that this is the Dalek that killed Clara and that he should take his revenge on it. In one of the episode’s most affecting moments, Clara desperately tries to let the Doctor know it’s her, but the suit will only scream over and over “I am a Dalek!” Just as The Doctor looks ready to take his revenge, Clara’s tearful pleas translate to a scream of “Mercy!” Alarmed that such a word can exist in the Dalek’s vocabulary, The Doctor deduces that it’s Clara trapped inside. Now, those knowledgeable of the Who universe will remember that a Dalek did indeed beg for mercy (in a more comical context) way back in the Season Five finale, “The Big Bang,” when it was being threatened by River Song. One could argue that this is an example of Moffat either forgetting, or simply ignoring a script he wrote more than five years ago. Or, and this is how I choose to take it, it’s the best kind of callback—after all, The Doctor was not present for this moment in “The Big Bang” and this would be something he would be discovering for the first time. Several bouts of questionable plotting aside, “The Witch’s Familiar” provides a more than effective conclusion to this season premiere, crystallizing the kind of clever scenarios Moffat does best while still taking the time to introduce some new corners of this already well-explored universe. As I mentioned in last week’s review, this story feels more like a season finale than anything else. Naturally, the episodes that follow will more than likely seem a bit smaller in comparison. Regardless, the episode does provide an invigorating start to a new season and further proof that, though he’s now five years into the job, Steven Moffat and his creative team haven’t lost their mojo just yet. Finally, the episode introduces “sonic sunglasses”—not sure how I feel about that quite yet.